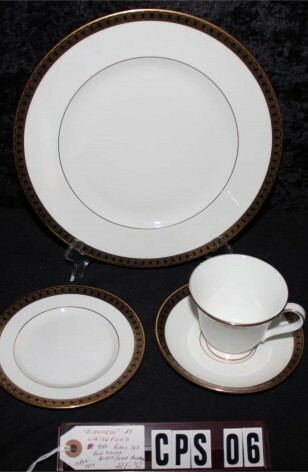 Waterford Fine Bone China, Four Piece Place Setting, "Ashworth" Pattern #WFCASH, Circa 1997-2001. A very Dramatic Four Piece Place Setting by Waterford Bone China, in the "Ashworth" Pattern #WFCASH. Lovely White China with Black Band, Embellished with gorgeous 22kt Gold on Outer Plate Edges, and Under Cup Rim. Plates have a 22kt Gold Verges, and all Items are Rimmed in 22kt Gold. A Very Attractive addition to any table or collection.. Very Good Resale Condition unless noted below or in pictures. 1 - Dinner Plate - 10 3/4"